First flown in November 1947, the 3 seat Hiller 360 was the first civilian helicopter to cross the United States. It was also employed by various branches of the U.S. military, which bought over 2,000 examples of the type. The tremendous advantages offered by helicopters were obvious to the IAF's founders well before the formation of Israel in May 1948. During the War of Independence, helicopters could have ferried supplies to outlying settlements, evacuated wounded soldiers and even allowed the rapid deployment of ground troops. Yet despite repeated inquiries into the acquisition of a number of examples, fighter aircraft continued to dominate the IAF's shopping list, already very short because of a very limited budget. 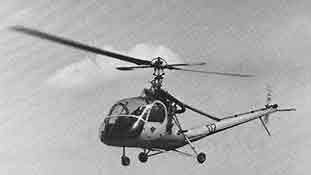 The IAF finally begun operating helicopters in May 1951, when a pair of Hiller 360s arrived in Israel. Operated by the 100th light transport squadron out of Ramla, the Hillers were utilized to evaluate possible uses for helicopters in the IAF as well as pilot training and a little search-and-rescue. In December 1951 they provided flood relief to Kibbutz Palmahim (home to an IAF airbase since the 1970s), while on another occasion they rescued a police officer off a capsized boat. During their years in service, one Hiller was almost constantly in maintenance while the other suffered from severe electrical problems. In April 1954 they participated in the shooting of a film when one of the Hillers crashed into a sandbank after flying too low. The remaining Hiller 360 continued to fly until 1959 when it was retired. Performance: max speed - 135km/h, cruising speed - 110km/h, range - 217km. Weights: empty - 730kg, max weight - 1,025kg. Dimensions: rotor diameter - 10.66m, overall length - 8.58m, height - 2.98m.